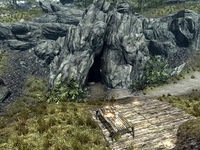 Cragwallow Slope is a small cave southeast of Windhelm home to conjurers and atronachs. There is a leveled conjurer guarding the entrance, however they seem to attack anything on sight including passive animals. In front of the entrance is a small platform made of wooden planks with candles and a table on it making it an easy location to spot. The magical implements laying about are a sign of the occupants inside. On the table are a random potion of magicka, a random potion of extra magicka, a random empty soul gem and a copy of The Firmament. Cragwallow Slope is more or less a narrow earthen cave that goes in a circle. Conjurers are found throughout the loop and due to the close proximity will quickly join battle once someone starts casting. The narrow corridors and swarming nature of conjurers and their summons can make for some very tight fights. Running out to break the daisy chain of creatures may be necessary as trying to fight through atronachs while casters safely cast on you can quickly become fatal. A high level of sneak and good ranged attacks can simplify this enormously. The conjurers are leveled and at very low levels they may only be able to summon familiars and be supported by flame atronachs. The entrance leads into a wide tunnel heading east to a T-junction, to the north is a ledge above that can't be reached from here, but will serve as a shortcut to the exit later. To the south the tunnel continues with three patches of fly amanita fungus along the tunnel. At the end it turns east and enters a room containing a leveled conjurer, quite a bit of vegetation with a square table at the rear with an alchemy lab built in, a random empty soul gem on top and a random potion of magicka and an apothecary's satchel beside it. There is quite a bit of natural light coming in from holes in the ceiling and two patches of white cap fungus in a darker area. A narrow tunnel climbs to the east in the northeastern corner of the room. The tunnel is fairly short and opens out into a larger cavern also full of vegetation and holes in the ceiling, with a leveled conjurer just ahead and a flame atronach patrolling the cavern. Any fighting will alert several more conjurers that are in caves ahead. The cavern curves to the left and exits into a tunnel heading north. The tunnel descends and at the end turns to the east, and continues to descend to a cave that is partially flooded below you with a ledge running around the walls with wicker fencing along the edge to stop people falling. There is a leveled conjurer at the bottom standing in the water, a frost atronach patrolling the path nearest you. There is a ramp down to the right leading to the flooded area and a path all the way around the edge to reach a tunnel heading south. In the flooded area there is little of interest apart from a random empty soul gem. Turning left and following the path around to the far side, there is a knapsack on the left and a random sword among a pile of firewood. Beyond this is a set of shelves holding a woodcutter's axe, a gourd, a pieces of canis root in one bowl and two torchbug thoraxes in another, with a basket on the floor beside it containing two fillets of horker meat. At the end the tunnel heads south, before immediately turning to the west. After a few paces there is a tunnel on the left into a small bedroom containing two unowned single beds with a dresser, an end table and an unlocked chest also in the room. On the dresser is a set of black mage robes, a random potion of magicka and copies of two common books. On the end table is a bowl of bone meal and a piece of canis root. Once past this room the tunnel descends again before opening out into a large cavern with part of a fort in front with an atronach standing in a hole in the wall. 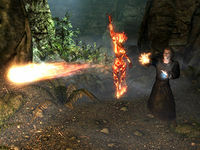 There is also a high leveled conjurer behind the atronach, but you may be unable to see them. There are stairs up to the north and south as well as several parts of the floor of the cavern that can't be seen from the entrance to the cavern. To the north, up the stairs is a ledge with two unowned single beds, one of which may be occupied by a conjurer. Beyond them is a round wooden table with a random potion of healing, a sprig of snowberries and three common books on top and a bookcase to the left holding eight more common books and a bowl containing three deathbell flowers. Past the bookcase is a barrel containing foodstuffs. Climbing the stairs to the south brings you to the top of a wall with an area behind where a conjurer is normally found working at an alchemy lab, with a table and two chairs to the left. On the table is a random potion of the warrior, a random potion of true shot and an apothecary's satchel. To the right of the lab are two racks hanging from the ceiling over a food barrel, holding three rabbits, a garlic braid and a bunch of dried elves ear. There is a campfire with a cooking spit hanging over it against the south wall. 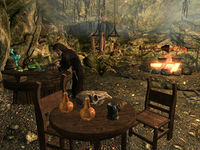 To the right of the fire is a bookcase holding nine common books and a quiver of random arrows with an arcane enchanter in front. Along the wall to the west are two archery targets on stands with a round wooden table to the left holding a long bow, a quiver of random arrows, a bowl of horker stew, a random potion of healing and a random potion of stamina, there is also a second long bow on the ground. Along the wall are several wooden benches. It is important to take out the conjurers on the ledges so as to make the final battle a lot more manageable, otherwise you can be overwhelmed if trying to face all of them at the same time. The central area will contain a higher level conjurer, a summoned creature, and a lesser conjurer. It's imperative to take out the easier to kill creatures and conjurers while avoiding the boss leveled conjurer at first. 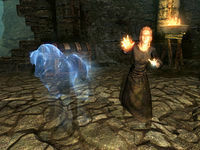 The main one will keep summoning a frost atronach, casting cold spells, and using a very effective heal. Taking him down requires some finesse or a lot of potions. If you don't have enough damage output he can easily out-heal your attacks. Upon killing him the summoned frost atronach should disappear, leaving you free to loot the room. At the southern end of the ground level is an unlocked chest and against the wall are two empty coffins. There are a few patches of fungus on the ground including two of Namira's Rot, one of white cap and two of blisterwort fungi. While at the northern end of the cavern is a corundum ore vein on the ground. 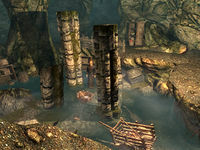 Through the hole in the side of the excavated fort, where the atronach and conjurer were standing is a well lit area with many lit candles on the floor, three empty coffins on your left as you enter with an unlocked boss leveled chest further to the south by a second hole in the wall. On your right as you enter this area is a table, a small cage, two bookcases holding twelve common books and a random filled soul gem, and a wardrobe all against the north wall, along with food sacks and a barrel between them. In front of these is a long wooden table with three common books, a random potion of healing and a random potion of magicka, a leveled filled soul gem and a copy of the Alteration skill book The Lunar Lorkhan. The path continues to the north at the rear of the fort area and at the top is a T-junction with a conjurer sat to the right in a dead end with a couple of tables and chairs with an adept locked chest and bookcase at the rear, it holds an iron dagger, seven common books and a copy of The Aetherium Wars. To the left the path climbs and leads around to the ledge near the entrance. This page was last modified on 15 March 2019, at 05:22.